Discrimination! At Macalester College in Minnesota, an Asian American professor is suing the school for discrimination in the promotion process: English professor brings discrimination suit. Wang Ping, who teaches creative writing, poetry and fiction at Macalester, claims that she was unlawfully discriminated against by the college on the basis of gender, race and national origin. In the lawsuit, filed under the Minnesota Human Rights Act, Wang is requesting ompensation for all earnings, wages, and other benefits she contends that she would have received if it weren't for the alleged discriminatory practices of the college. Wang was hired by Macalester in 1999 and began working as a tenure track assistant professor in 2001, teaching Creative Writing in the English Department. In 2003, Wang's request to seek early promotion to the position of associate professor was denied by the college. 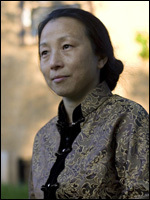 In 2005 Wang was ultimately promoted to associate professor with full tenure, and sought promotion to full professor in 2009. She was denied her promotion to full professor, and was told in a letter that her application "did not provide sufficient evidence that you have met the standards for promotion at this time." Court documents note that a white, male colleague in the same department also applied for promotion around both times Wang applied, and was granted the promotions on both occasions, despite the fact he had fewer published works and less service to the community. There were also documented procedural violations in the promotion process. "Everyone told me my [promotion] was a slam-dunk, that I've done more than enough," Wang said. "And I was denied. I was just really shocked." Passed over for promotion while white, male, underqualified colleagues advance? Ah, the story of America. For further explanation of the lawsuit in Wang Ping's own words, she's written a lengthy, detailed Facebook post outlining the matter here.